If anyone can't figure out China is tanking iPhone and Samsung relative to Huaweai then they're stupid. But what if IDC's "estimates" are wrong? They've been wrong before about their estimates haven't they? This is only smartphone (supposed) shipments, nothing about the amount of money Apple made that none of the others came close to making. Of course, we're also talking about IDC, which have always been estimated shipping figure, never actual sales numbers. Profits anyone? What do the bottom line numbers tell us about who is really doing the beating versus who is taking a beating? “SHIPPED” is not “SOLD”. and whatever it is Samsung did actually sell, how much of it was actually profitable phones and cheap crap phones? why post the same garbage every time? The bigger story I think is how Huawei gained 43.9% while Samsung and iPhone are both in declined (negative)? - and in some extent, Oppo and Xiaomi also see an increase in shipments while market is in average -4.9% compare to last year. Counterpoint and canalys proved that Apple dominated the premium and ultra premium market . Samsung can send thanks to entry level. All the strategic companies , like counterpoint and canalys, just say that over than half of huawei successful production is Honor. Not premium smartphone . Market share? Hmm, I wonder how the ASPs match up. Huawei thanks honor brand. In the premium and ultra premium market huawei don’t sell . Apple got a year of record . For the first time the most expansive smartphone , iPhone X, was also the best seller all over the brands. This year Apple got the second best quarter of all time . Think at that. IDC's numbers are submitted directly by the manufacturers (ie. Apple, Samsung and the other companies submit these numbers). So no, they are not wrong. They are ALWAYS wrong (just like Gartner). It’s only a question of HOW wrong, and will it make a material difference. 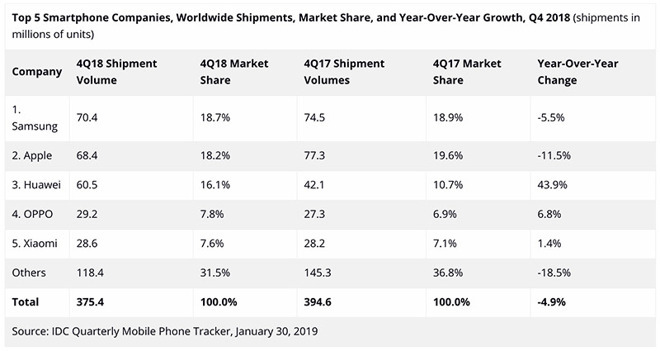 In this case, it’s *possible* that Samsung shipped more low-end phones than usual and captured the “most” flag, but as noted by others shipped is not sold and Samsung is known to take back huge numbers as well (and analysts never seem to care about that bit somehow). It’s also entirely possible, especially given Samsung’s reported revenues, that IDC is just plain wrong — Samsung has of late been dropping way harder than Apple, because (to be blunt) the S9 is a flop. No they’re not. Apple for one doesn’t share that number anymore with anyone and Samsung never did. that’s estimates from their research such as it may be along with their “proprietary tools” (they model markets). Not company reporting. Nope. Why would they submit numbers to a third party and not submit numbers to shareholders? note to IDC: Apple isn’t in the units race. While Apple may not be in the units race, they still lost compared to last year. Just take the small loss and move on. They still dominate profits and ASP by a large margin. And even while Huawei may compete in the razor thin margins sector of the market, their notable growth is pretty impressive. Huawei broke records with premium and ultra premium phones. In fact, all of its premium and ultra premium phones showed massive YoY gains. Honor also has premium phones now and is competing directly with Huawei branded phones. That's why the Magic 2 shipped a few weeks after the Mate 20 and also had the Kirin 980, Supercharge and it was Honor that announced Bone Voice ID. As a company, Huawei bucked a downward industry trend with massive YoY gains in unit sales and record revenues from the consumer business group. And without open access to the huge US market. That is impressive whichever way you look at it and without doubt they are also picking up iPhone users or potential iPhone buyers. Apple needs to do something, emerging markets are going to be a problem if they continue to follow this path. The iPhone 6 was 3200 reais and A LOT of people bought it in Brazil! Please....i want to see and hear the word SOLD, not freakin shipped. This view is incredibly myopic (and childish). Btw, iPhone revenues were down almost 18% YOY according to Apple’s consolidated financials. I don't have the links to hand right now but Huawei has said in multiple presentations that they sold over 200,000,000 units. As most of their models are periodically sold out anyway you can be sure that shipped equates to sold.